Henda was the fourth of five sisters born in a small Burmese township of 1,000 people. It was a normal Burmese town filled with drug trafficking, tribal banter, and a deep-seated hatred typical of the region. Henda's family was prohibited from trafficking drugs due to local interests, which eventually gave them no choice outside of poverty. 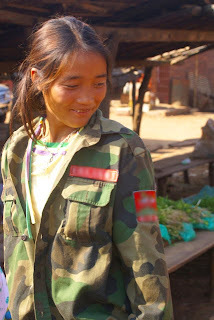 When Henda graduated from 6th grade at 11 years of age, her teachers - representing government interests - offered a "promising" army program to study medicine and electronics. With dreams of rescuing her family from their current poverty, she signed up and was force recruited into a dance troupe owned by the local military base. She spent the next 4 years as a slave. When we interviewed Henda and listened to her experiences with violence and hardship, the pain her memories inflicted was clear. She worked the fields or did military drills all day, and then danced in the evenings. Food was always rationed and in short supply. The cost of making one mistake was mandatory beating by all the other children with sticks and belts. (Further punishment was given to those who didn’t participate.) Boys over 10 (who could carry guns) were given access to alcohol, drugs and were fed meat. Girls were not. They had to work in the fields with the younger boys, and were sometimes used as prostitutes even though the soldiers generally already had wives. Henda fled the army at risk to her life when she was 16. She couldn’t return home because the army knew where she lived and harassed her family. By the time we connected with her, she had fled the country. Tragically, many with a similar history of poverty and armed conflict are not as fortunate to escape. Project: AK-47 exists for children in Henda's former position. It uses education programs for local communities to secure the release and care of their child soldiers. Our hope is to see many more children in compromised positions find a life with another choice outside of soldiering or slavery. You can give others like Henda hope by joining Project: AK-47 $7 monthly rescue and care campaign. Henda and kids like her are part of our world and we can do something positive to make a difference that counts!